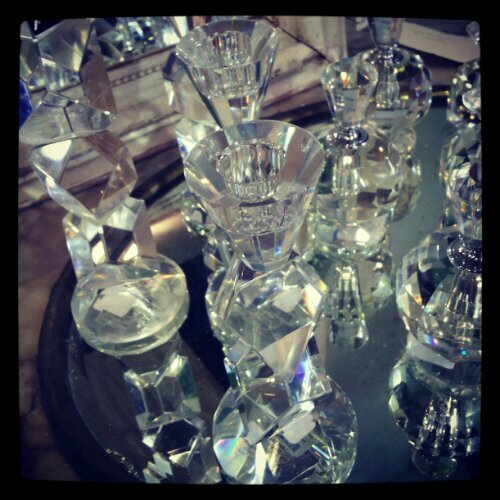 I am in love with these gorgeous, multidimensional beauties from Anthropologie. These photos were taken in Santa Monica, CA on a recent visit last week. They come in several different heights and they reflect light in a mesmerizing way, don’t you agree? Geometric crystal on metal trays that expand the reflected light is becoming an inspiration to me – we have a lovely crystal vase that sits on a silver tray at the moment and is beautiful to look at. For the time being, I don’t see how these candlesticks could fit with our current decor overall, but perhaps I could find a way to built and blend them in somewhere :). They don’t need candles in them to be functional as art! 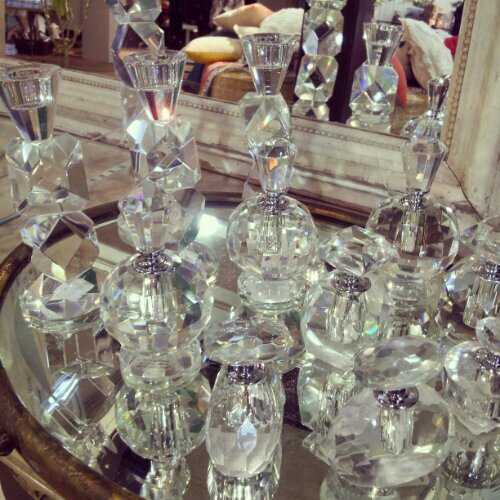 Tags: Anthropologie, beautiful, beautiful interiors, candlesticks, crystal, mesmerizing. Bookmark the permalink. Previous post ← It’s grapefruit o’clock!